I drag this one out of mothballs every spring because it still fits. I found sea duty difficult. As the band's chief, I was the referee of a Texas cage match among sixteen professional wrestlers. I was the marriage counselor for the sax player who got the bad letter from his wife. I was trip planner who had to beg a surly coxswain for the admiral's barge so the band would be ashore in time for the concert. I was the guy who sucked up to the laundry petty officer so the trio would have clean whites for the captain's reception. I was the whipping boy for the MCPOC who hated the band and would have reamed out my boys if I didn't let him unleash his temper on me. I was nursemaid, babysitter, tour director and music theory teacher. Sometimes I was even the chaplain, the shepherd who brought comfort to the desolate. And when I got the call in the Indian Ocean that my father was dying, my boys brought the same to me. At times, I wanted to crawl into the nearest empty locker and hold my breath until the cruise was over. And there were times I felt sorry for everyone in the world who was not, at that very moment, on a ship of the United States Navy in the Indian Ocean conducting this ragtag, 16-piece bagband through "Anchors Aweigh" during unreps. Most people, despite their love of country and their respect for our service, cannot understand this. See you next week in Orlando. 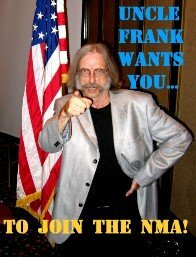 Frank, although we have never crossed paths, except for maybe while I attended the Refresher Course at the "school"...1980-81, no truer words have ever been spoken. One day I hope to personally meet you. Ahhh, surface fleet stories. I hated the surface fleet - most of them were too stupid to comprehend what our mission was when we were aboard (including officers) and did little to get enlightened. The smart few, usually SEALS, Seabees and Marine Airwing, would hang with us 'cos once we hit the shore, that's where the party was!